Click play to see an extract of the story of Nancy, a young African Suffragette leading a movement to end FGM and child marriage.The song used is by kind permission of Kigame Media. There is no tool for development more effective than the empowerment of women. (Kofi Annan) Yet globally one girl undergoes female genital mutilation (FGM) every 10 seconds. In Nancy’s Pokot Tribe, girls are cut when young and sold for a bride price of cows into early, forced marriage. Nancy has successfully resisted these harmful practices and is inspiring change for herself and other girls. Nancy’s story is unique, for there are very few feminist heroines (whose lives are recorded) in such remote places. True stories captured on film can have huge impact. Our mission is to share Nancy’s story on film and help her and other’s use it to educate, shift attitudes, inspire change and save lives. Please support our film and impact campaign and help Nancy fulfil her dream to empower women to go on to transform their own lives and culture! Nancy A One Girl Revolution is the story of Nancy, a young African ‘Suffragette’, leading a movement to end FGM and child marriage. As a young rebel, she resisted for a decade and then went on to help save many other girls within the Pokot region of Kenya. A brilliant speaker and a fearless taboo-breaker, she is now leading a girl revolution, yet she is still just a college student. Over 6 years her story has been filmed, observing her as she resists being cut and then pledges to her tribe to become an example for others to follow. Having proved herself, she is sponsored through secondary school by the Commonwealth Girls Education Fund, an organisation with links to the Suffrage movement. After her years of protesting and campaigning as a school girl, the film sees her invited by UNFPA (the United Nations Population Fund) to address the First Ladies at the United Nations in New York. Her speech so impressed the Kenyan President’s wife she hugged Nancy and offered to assist her. Nancy later received the Bianca Jagger Human Rights Award for Courage, and then educational support from the Madrinha Trust. Nancy wants her story to empower others, so the project includes working with Nancy to screen her story far and wide, wherever it can inspire women and girls to achieve their fullest potential. The Commonwealth Secretariat and Baroness Scotland will host an event this Summer in conjunction with CGEF (The Commonwealth Girls Education Fund) and Sara the filmmaker to screen Nancy’s film to key NGO’s, Govt. dignitaries and the media in order to build awareness and provide guidance at top levels within the Commonwealth. The British Government’s Department for International Development (DFID) is using an extract of Nancy’s story in girls clubs in Kenya run by the Adam Smith Institute. A good pilot test for the longer film’s use! Both UNICEF and the Kenyan Government have shown interest in supporting it’s use in the field. Showed Nancy's Story short film in key note video to commemorate the International Day for Zero for FGM on 5 February 2016. Sara was given seed development money in 2013 from CBA Worldview (funded by DFID) on the basis of the impact Nancys story could have. Help raise money and get a credit on the film! Why not have a tea party and charge for fairycakes? Save your pub money for a week and donate it? put on a concert? donate an artwork, get involved in any other way we’d love to hear from you! Check out the video below of a recent fundraiser held at the Amanzi Lodge in Zimbabwe that raised over $3,000! Please donate whatever you can and/or share our donation page on your facebook or twitter page. Every action helps. Help us raise £75,000 to fund the completion of the feature-length film 'Nancy's Story - A One Girl Revolution' and support our film's vital community distribution campaign to help stop FGM and child marriage across Africa. The story highlights the change happening within African women, who have been silenced for centuries, who are finally being given a voice and a platform to be heard. It is a story of hope, and it can help to accelerate change wherever it is seen, which is why the distribution of the film is so key. Tribe by tribe and village by village, it is hoped that this film can transform attitudes across Africa, and perhaps even worldwide. Filmmaker Sara Nason is building global partnerships around Nancy's story with the support of various NGOs and guidance from the UNFPA. 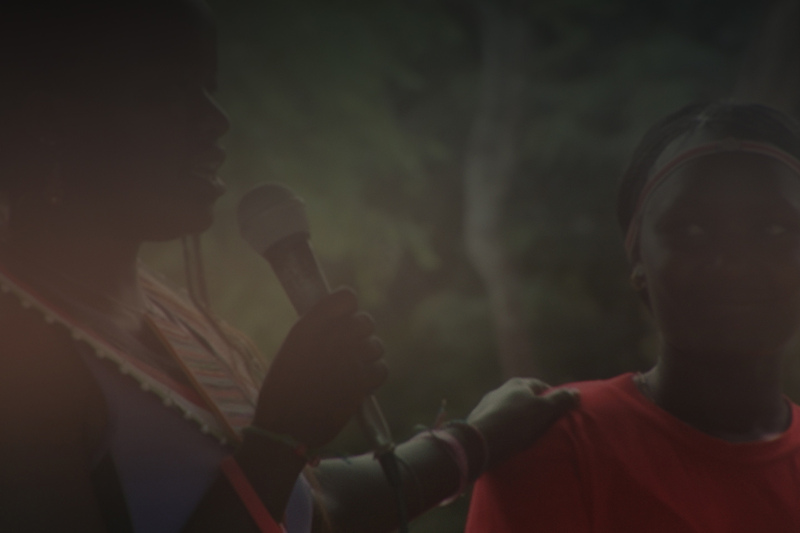 First Sara intends to use the film to spread Nancy’s message across the Pokot Tribe, then the region and beyond. While there is much support already for the cause, funding a film like this is key to changing attitudes and inspiring the abandonment of the practice. So far it has been mostly funded, by Sara herself, but financial support is needed to fund the final stages and ensure the film reaches its full potential.